Alison has specialist knowledge in the treatment and rehabilitation of sports injuries. She has also developed an interest in occupational health, ergonomics and work place assessment. She has the expertise to provide onsite advice and guidance in the office environment to help minimise the risk of work related injuries and repetitive strain. Although better known for her firm manual skills and strong mobilisation techniques, Alison has recently ventured into the gentler, holistic world of Reiki and is qualified at the Okunden Second Degree Level. 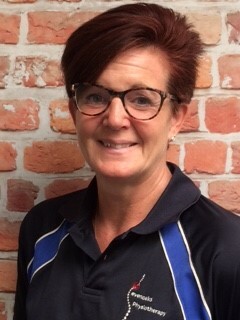 In conjunction with this and for her own personal development Alison has also investigated the benefits of Yoga, particularly in relation to postural correction and thoracic flexibility and is effectively incorporating this into her Clinical Practice. Outside of work, Alison spends most of her free time with her two teenage children and her Labradoodle. She is a keen camper and hiker and all round outdoors enthusiast. Having long jumped for the County in her youth and also touched down a few tries on the rugby pitch playing on the wing for the Camberly Cocktails, Alison now enjoys a more sedate level of tennis at her local club in Horsmonden and Iyenga Yoga, courtesy of Toni Elliott at The Manor Clinic.